It’s name is Aipom. [AY-pom]. 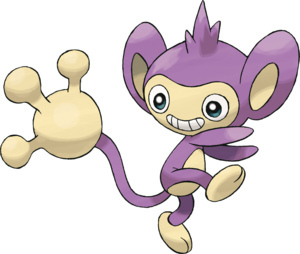 Aipom uses it’s tails to grab things that are out of it’s reach, since it’s tail is more effective than it’s hands. Possible Moves:Scratch,Tail Whip,Sand-Attack,Astonish,Baton Pass,Fury Swipes,Swift,Screech,Agility.Double Hit,Fling,Nasty Plot,Last Resort. ©2013-2019 puppymeow.com. All rights reserved.